Working Paths are the folders used by Blackmagic / Megarip / Veripress Servers and Cluster Nodes to store and process jobs. Spool – the folder to which jobs sent from the main server are spooled prior to processing. Temp – the folder to where the jobs are moved after spooling ready to be worked on. Raster – the folder where jobs are held while imaging and rendering, before being returned to the main server. Users wishing to improve the performance of Blackmagic / Megarip / Veripress Cluster Nodes can utilise a Solid State Drive (SSD) for working path folders. A Cluster Node will often be able to image and render jobs faster than they able to be written to disk. For workflows processing large jobs or great numbers of files, an SSD improves performance by effectively removing hard disk read/write speed as a factor when processing jobs, and when transferring files back and forth to the main server. IMPORTANT NOTE – while most SSDs have very fast Read speeds of around 500+MB/sec, cheaper drives have significantly slower Write speeds of around 100-200MB/sec. In order to best make use of an SSD, it is advisable to install one that has sequential Read AND Write speeds of 500+MB/sec. Cluster Node Servers can not be accessed using a Serendipity Client, so Working Paths (in the Client > Server menu > Server Settings) can not be configured in the normal way. To set working paths for the cluster node, it is necessary to make changes to the ‘ss.conf’ file in the cluster server installation using a text editor. 1. Shut down the Cluster Node Server. 2. Install and format an SSD in the computer on which the Blackmagic / Megarip / Veripress Cluster Node Server is running. 4. 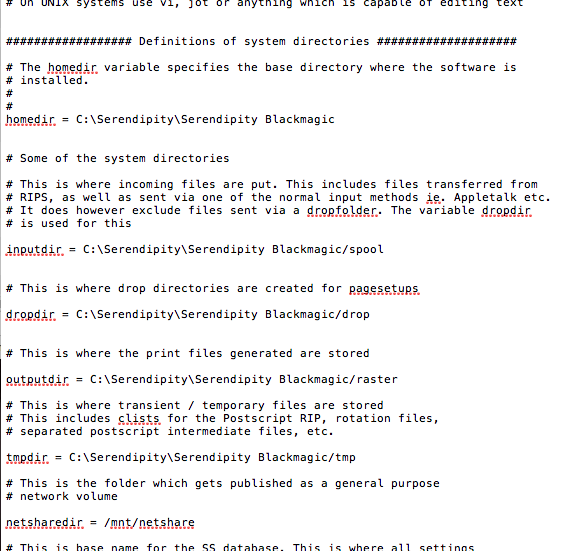 Navigate to the …/Serendipity/Serendipity Blackmagic/etc/ folder on the same computer (or the same location in your Megarip / Veripress cluster node installation). 7. Save the ss.conf file. Restart the Cluster Node. Files for jobs submitted to the node should now appear in the SSD folder during processing. Note – In the event of a significant mishap when editing/saving the ss.conf file, simply delete the file. It will be recreated with default directories when the Cluster Node Server restarts.